Bright and full of color, this unique long sleeve swimsuit for women is a sure bet for protect yourself from direct sunlight after swimming once getting out of water. Made from super-stretchy fabric that supports dynamic movement. This new style including a long sleeve tankini top and a matching swim brief. 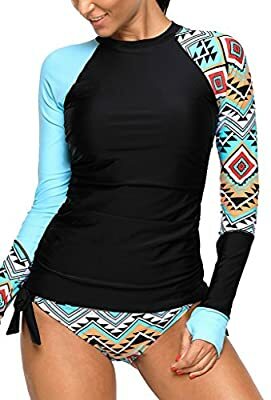 It is not only great for swimming but quite popular with modern ladies for surfing!